Hey there. I’m not claiming that humans need religion to be moral – although history does show that Christianity has improved the morals of many societies when it was introduced (e.g. Britain, Waodani tribes, Fiji for example). That’s not the moral argument. The moral argument says that morality is independent of what humans think about it. So when people thought it was OK to burn witches at the stake, it was wrong. Even though the people at the time thought it was right, it was still wrong. Do we agree with that? So my point is, if there is that external morality independent of people’s judgement, where does it come from? If we are just atoms and molecules and our morality comes only through evolution, why is it that there is right and wrong? But as a materialist atheist (from what you’ve said elsewhere this is what I’m assuming! ), you do believe that our brains and our personalities are just based on molecules, don’t you? If not, what are they? I’m afraid I’m not yet convinced by your point, because lots of societies have been really murderous and immoral (by our standards). The Waodani tribe believed in killing anyone who did you wrong, until some Christian missionaries came to them and showed them a different way. 1) do you agree that there is objective right or wrong, that is independent of what people think about it? In other words, if Nazis had taken over the world and everyone thought it was a good idea to kill Jews, would that still be wrong? 2) If there is this objective morality, where does it come from? Our brains are our brains. They are a composite of the requirements passed down through evolution. To say we are just molecules is like saying we are just the Big Bang. It’s true, but it doesn’t answer the questions we’re looking for. As for the Huaorani people, I’m not sure how you think that this helps your case. Describing their history by saying “Christian missionaries came and showed them a different way” is a drastic oversimplification. The Huaorani people did not believe that killing each other was a good thing. They killed missionaries who invaded their territory. That’s to be expected. They felt like they were being attacked by these strange foreigners. As for your questions, yes, I believe in an objective right or wrong for certain crimes. That is, heinous crimes. I mentioned this many times before. You stated, “if Nazis had taken over the world and everyone thought it was a good idea to kill Jews, would that still be wrong?” This is misrepresenting my point. My point is that if Nazis had taken over the world everyone would NOT think it was a good idea to kill Jews. They would be under the oppression of the Nazi leadership. I don’t know how I can state this any more simplistically. This is my whole point. The second point, as I said above, the objective morality comes from our brains. Not molecules, brains. Brains that are a by-product of evolution that has allowed us to be social creatures. Seriously, I don’t mean to sound rude, but I’ve answered all these questions already in my previous comments. Take a look above. 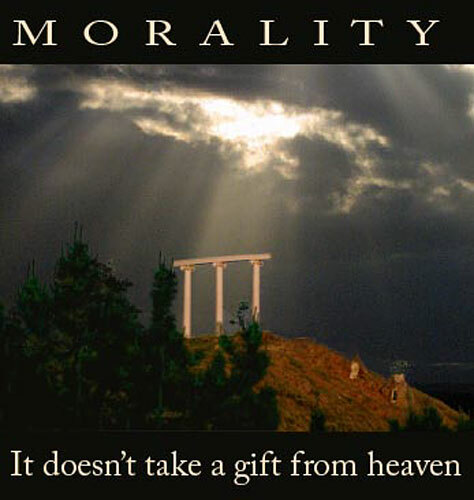 Morality is an in-built quality of humans and had it not been for the beautiful gift of Islam i would have been lost as to what is good and what is not. There are literally millions of people accepting islam in the west and highly educated and competent ones at that and so it begs the question why is that? Because they are deluded?!? NO! Its because it makes sense. Your post however does not. I require evidence for two things you have stated. How do you know Islam created morality? Why did my post not make sense? You cannot just state things without supporting evidence. That’s called logic.